Readers of a certain age will no doubt remember the remarkably popular gameshow ‘Play Your Cards Right’. It was hosted by Bruce Forsyth and part of the game involved guessing whether the next card drawn from an oversized pack was higher or lower than the preceding one. The audience yelled their thoughts as Brucie chipped in with his familiar jokes. Card Climber is a classy-looking version of that higher/lower game from Microgaming so read on to find out if it’s worth checking out. When you first load up Card Climber you will be faced with a glossy, sparkly screen displaying five face-down cards in a gold and red frame. A stage and spotlights in the background give the impression of a television studio although there’s no evidence of any connection with Brucie. First elect your stake using the ‘+’ and ‘-‘ buttons in the bottom left hand corner; this ranges from £0.10 to £10.00. Now just click the big purple ‘Play’ button to get things started. You will be shown an initial card on the left hand side and all you have to do is decide whether the next card will be higher or lower. You have the option to swap the first card just once if you don’t like it (for example if it’s a 7, 8 or 9). You are trying to achieve five correct guesses in a row after which you will be awarded a multiplier of your stake. If you reach five you can choose to continue to the next level of five or collect your money. 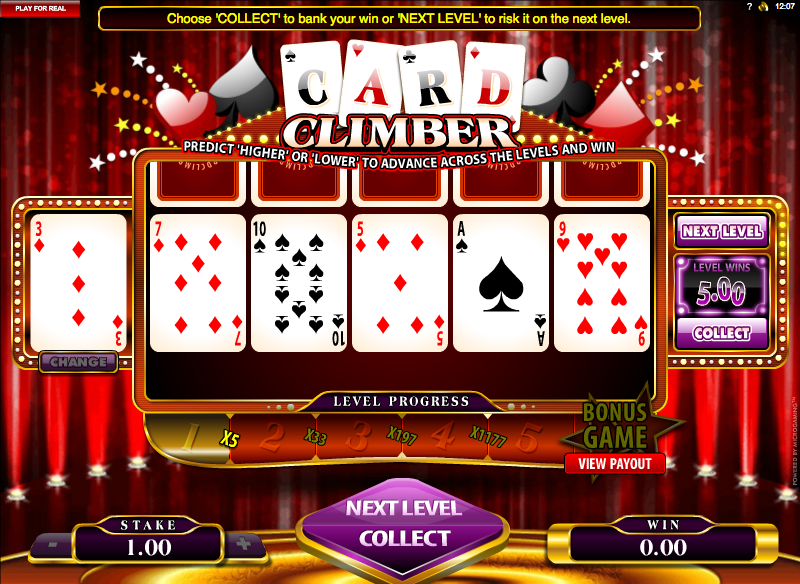 Level Five – enter a bonus game in which a random multiplier of between 3000x to 10000x is awarded. That’s all there is to it and it’s clearly a pretty simple game. There’s an RTP of 94.97% but that must surely be with some pretty tight strategy – play it with care.